I removed the link to my E-mail due to spam. I welcome genuine inquiries and comments so to overcome the spam problem I provide my e-mail address as a graphic. Note: It cannot be “clicked” to automatically place it in your E-mail program. Open your E-mail and type it in the “TO” box. I have added a bit about myself just to give a little perspective to my Jaguar E-Type Web pages. This is my second collectible Jaguar, my first was an amazing Jaguar XJ Coupe V12 which I restored from a very original example. You can see the details at my Jaguar XJC web site. While racing Super Karts in 1982 I had a serious accident and badly injured my back and spinal cord, which left me a paraplegic. 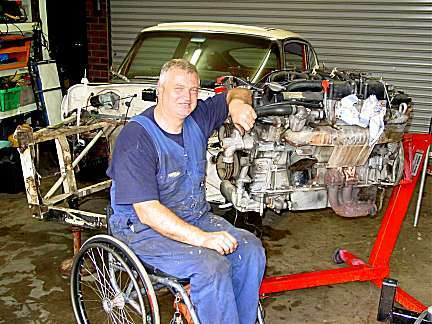 Using a wheelchair for my mobility hasn’t slowed me down much and over the years I have undertaken a number of projects in my “Man Cave”..
Getting a bit more mature, with no kids at home and a bit of money available I decided it was time to indulge in the classic cars that I had admired for years. I had been to the car shows, concourses and show and shines etc. and I had read all the relevant magazines from cover to cover since before I could drive. The final decision to undertake a restoration was made when a good friend put up his hand to help with the more difficult aspects of the work. Malcolm is a car and motorcycle enthusiast and he saw his involvement in this project as his way of “owning” a classic Jaguar restoration. He completed magnificent restorations on a 70’s Suzuki motorcycle and a Norton Comando, so he was an experienced restorer. I must admit that without Malcolm’s help the Jag restoration would not have been possible. Before the E-Type I purchased and restored a Jaguar XJC V12 and after gaining experience of Jaguars with this magnificent car I decided to take the plunge and obtain my long dreamed of car - an E-Type Jaguar. I hope your visit to this site is informative and entertaining. Feel free to E-mail me with any comments, suggestions or questions.